Come the end of the season, you may need to find out how many matches a person has played during the season to determine if they are eligible to participate in finals matches. This can done via the public MyCricket site. Select the relevant Season, Grade and Date Range. Click Go. 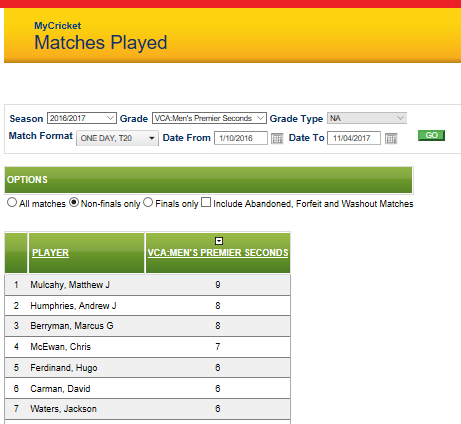 A table displays showing all the players who have played a match in the grade for the selected season. Select the relevant Option from either All Matches, Non-Finals only, Finals only, Include Abandoned Matches. Note: If you select "Include Abandoned Matches" then all Abandoned, Forfeit and Washout matches will be included in the total. The data can be downloaded to excel format via the 'Download Data' at the bottom of the page.